Yeah, you know it’s not great for teeth, but candy is still one of your child’s favorite snacks. After years of munching on various chocolates, your child has started complaining when they chew. Instead of just ignoring that sign, it’s highly recommended to visit your dentist in Lynnfield. Treating potential cavities sooner than later can actually save teeth rather than leaving to other dental problems. Do you know where the word carries derive from? It’s Latin for rotten! When teeth are overexposed to dental debris and plaque for too long, tooth decay can occur. Believe it or not, 90% of school-aged children and nearly 100% of adults have dental carries! 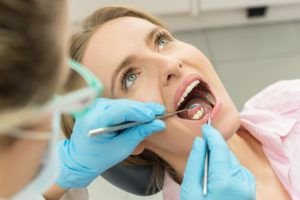 Why are cavities becoming so common? Here are some reasons for tooth decay. Brushing teeth and flossing daily is key to good dental hygiene at home. This is important at every age! If you skip even some parts of dental hygiene practices at home, you’re raising your chances of developing cavities. Eating sugary foods and beverages are one of the leading causes of tooth decay. Sugary foods that stay on your teeth feed the dental bacteria that already exists within your mouth. This can lead to enamel erosion. When it comes to the health of a smile, your genes may play a part. But just as your genes determine hair color and height, they’re responsible for your teeth. From the straightness of your smile to the enamel of your teeth, your family’s genes may determine whether you’re more prone to cavities. That’s right, your enamel may be thinner than someone else’s. Mild to sharp pain when eating or drinking something sweet, hot, or cold. Visible holes or pits in teeth. Brown, black, or white staining on the surfaces of teeth. If you have impeccable oral hygiene but still experience cavities, it may be time for help from your dentist. Ask your dentist about fluoride treatments or any other ways to further protect your teeth. Dr. Schumacher and the rest of our dental team at Schumacher Dental strives to offer patients from Lynnfield and surrounding communities excellent dental services. We go the extra mile to get to know patients, their families, and their dental goals. If you have a few new goals to reach yourself, feel free to call and schedule an appointment with Dr. Schumacher by dialing (781) 334-3400.